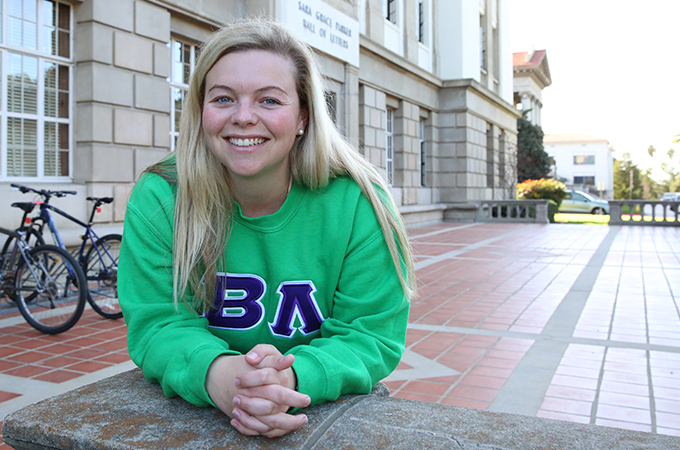 “I’m a big fan of Greek life at the University of Redlands,” says San Diego native Rebecca Bayer ’18. A business administration major and spatial studies minor, Bayer became involved in the Greek community on campus during her sophomore year by joining Beta Lambda. As the current president of the University’s Panhellenic Council, the body of sororities on campus, Bayer’s responsibilities include meeting with the Inter-Fraternity Council president, co-hosting Greek council meetings, and making sure everything goes smoothly during Rush—a biannual event where sororities recruit new members.